We have some incredible African fat-tailed geckos for sale! Most importantly, we have a real biologist on site. Above all, with a biologist ON SITE we are proud to work with top fat tail gecko genetics. Even more, we have created a unique variety of African fat tail gecko morphs. Below you will find some information on the various fat-tailed gecko morphs for sale offered at Tortoise Town and Cb reptiles for sale. African fat-tailed geckos are nocturnal ground dwelling lizards that originate from desert areas in West Africa. Interestingly, African fat-tailed geckos are becoming an increasingly popular pet. Because of their ability to thrive in captivity but also because of their docile dispositions. Most of all, their openness to being handled. The whiteout morph is one of the rarest and most sought-after African Fat Tail gecko morphs. Secondly, Whiteout fat tail geckos are some of the higher priced geckos. Because they are rare and years of selective breeding were spent to create such fantastic looking animals. Our 100% captive-bred White out African fat tailed geckos for sale are from top quality genetics. Because with the right lines, Fat-tailed geckos for sale are available in many fat tailed gecko morphs for sale. Some of the fat tail gecko morphs include oreo african fat tail gecko, whiteout African fat tail gecko, albino african fat tailed gecko for sale. Secondly, there are striped fat-tailed geckos for sale and a combination or variety of the above morphs expressed in many ways. Likewise is the white striped oreo fat tailed geckos for sale and more. African fat tail geckos are known for their mild temperament and relatively laid-back personalities. Most importantly, when you buy a gecko from us, you automatically receive our 100% live arrival guarantee. All of our white out African fat tail gecko for sale are hand raised and handled often to remain as tame as they are beautiful. Most noteworthy, all of our geckos ship is via UPS or FedEx next day air. Lastly, we ship in heated or cooled insulated shipping boxes, with 1 shipping charge covering up to 4 geckos for sale. 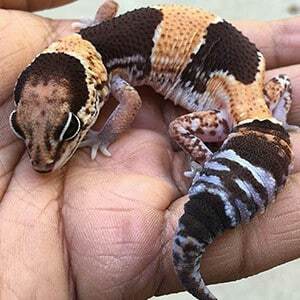 If you’re looking for some of the nicest African Fat tail gecko for sale near me, you’re in luck! Tortoise Town ships nationwide for 1 flat fee of $39.95! That’s right, for up to 4 baby fat tail gecko for sale, or even adult fat tail geckos for sale. Finally, we offer flat rate shipping, there is only 1 Overnight shipping fee! At TortoiseTown.com, we have a biologist on site, and handle our geckos often in order to ensure a friendly, calm and relaxed pet. Also noteworthy, we only work with top genetics to ensure we are improving the captive bred species. Because our goal is to provide the best possible pet geckos for sale in the world. We offer even more captive bred geckos for sale online at our sister store, CBReptile offering african fat tailed geckos for sale, as well as baby african fat tailed gecko for sale. Similarly, if you are considering purchasing an African fat tail gecko for sale, or any fat tailed geckos for sale, you have come to the right place! Due to being African Fat tail gecko breeders, we love working with this amazing species who is both docile and beautiful. Consequently, though all baby geckos for sale are cute, these baby fat tailed geckos are as cute as it gets! Did you kow that normal fat tail gecko coloring consists of a pale tan or brown background that is accented by bold brown and tan stripes? Additionally, some also display a thin white stripe along their back. They are one of only a few species of geckos that have eyelids. Because of this many geckos lick their eyeballs. Functional eye lids help keep their eyes clean in their dusty natural environment. African fat-tailed geckos are not yet as widely available as the more common leopard geckos. Interestingly, though rare, they are available online through fat tailed gecko breeders. Another reason to be sure to purchase from a fat tail gecko breeder who specialize in their captive breeding. You may also be able to find them at your local reptile expos. Also, wild caught geckos may be available but we strongly recommend purchasing captive bred animals. Color and pattern morphs have become more widely available thru captive breeding. As a result of captive breeding, you can select from many different beautiful colors. Fat-tailed geckos have a similar body shape to a leopard gecko but typically have a larger head and sturdier feet. Hatchlings will typically be about 2 inches and will grow to around 9 inches. Males will be slightly larger and have wider heads. When cared for properly fat-tailed geckos have been known to live for 15-20 years in captivity. Regardless of whether you are a hobbyist/breeder or a pet owner, our advice is the same and that is to keep it simple. For pet owners, your best option for caging is a glass enclosure (aquarium). Fat tailed gecko hobbyists or breeders who will be keeping several geckos should look to a rack system. A 10-gallon aquarium can a pair of geckos. Multiple female geckos can be housed together or can be housed with a single male. Also, it is very important to never house two male fat-tailed geckos together. Because males will defend their territory through aggressive fighting that can cause serious injury. African fat-tailed geckos are nocturnal so shelters within their enclosure. Shelters will provide them with a peaceful retreat to sleep or hide in. Also, they can be as elaborate as you like or can be as simple as a plastic container turned upside down. Be sure to cut a door into it to allow the geckos passage. At least one of these hide areas should be kept moist, to assist the shedding process. In order to keep damp, we recommend using damp paper towel or moss that you spray. We recommend putting the dry shelter close to the heat source while the moist hide is placed at the cool end. African fat-tailed geckos require a slightly more humid enclosure then leopard geckos. Because of this requrement, we suggest misting the enclosure a few times a week. African fat-tailed geckos should be exposed to light for 10-12 hours per day but because they are nocturnal they do not require a UVB light. We believe it is best for the heat to be provided from below. In the case of a glass enclosure, one can use an under tank heater, while the breeder’s best option for a rack system is a heat cable or heat tape controlled by a thermostat. Remember, reptiles are cold-blooded and rely on their environment to control body temperature. Because of this, it is important that the heat source remains at approximately 90F and is situated at one end. This will give the gecko(s) the ability to thermoregulate by moving from the heat source to a cooler area of the enclosure. Lastly, the temperature in the cool end should range from the high 70s to low 80s. In other words, do not heat the entire enclosure. For ease of cleaning and health purposes, we recommend using a paper substrate such as newspaper, butcher/packing paper or paper towel. DO NOT use sand as this can cause the gecko to be impacted within their digestive track should they ever ingest it. The African fat-tailed gecko diet typically consists of crickets and/or mealworms. They may also readily accept silkworms, waxworms or pinkie mice, but these food items should only be given as a supplement as they are high in fat content. Geckos that are under four months should be fed about five crickets every day and juveniles and adults should be fed about nine crickets or mealworms three times a week. Crickets should be appropriately sized for the gecko and as a general guideline, we feed ½ sized crickets for hatchlings that are less than six weeks old, and then feed 2/3 sized crickets right up to and including adulthood. Crickets can be put in the enclosure to roam but should be removed if your gecko does not eat them within a few hours. Mealworms can be left in a shallow dish. Fresh water must be available at all times and can be provided by utilizing a shallow dish. African fat-tailed geckos can be shy, but can also be open to being handled and can become tame with regular contact. It is important to always take great care when handling a gecko and it is important to never hold or constrain a gecko by its tail. The tail of a fat-tailed gecko will detach as part of a defense mechanism called caudal autotomy. If your gecko does drop its tail, it will grow a regenerated tail, but it will have a different appearance than its original tail.